Merchants National Bank Building is Indy’s prime example of Chicago School office design. Merchants had existed in Indianapolis since 1865. During the 19th century, the bank was a commercial lending institution and served major Indianapolis firms such as Eli Lilly & Company, Stokley-Van Camp, and famed department store L.S. Ayres & Company. Later, individual accounts were accepted. In 1905, the Board of Directors elected to build a new headquarters at the most important intersection in Indianapolis, Meridian and Washington. Meridian Street is the east-west divider, while Washington Street – the National Road – divided north from south. The board hired D.H. Burnham & Company of Chicago as architects. Daniel Burnham, principal of the firm, was the leading force behind the architectural and engineering success of the 1893 World’s Columbian Exposition in Chicago. Burnham and his fellow Chicago architects, especially Louis Sullivan, had developed the new skyscraper into an art form. 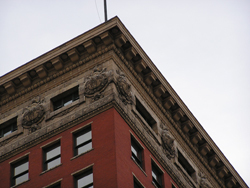 Sullivan’s formula of base-shaft-capital, to organize high-rise buildings into a coherent form, is much in evidence in the Merchants Bank design in Indianapolis. Construction was completed in two phases, with initial occupancy in 1908. Upper stories were finished by 1912. Rather than Sullivan’s trademark organic ornament, Burnham chose the language of Classicism to cloak the exterior of the Merchants tower. The “base” including first floor and mezzanine are of Indiana limestone, in the form of Classical piers. The attic floors are profuse with Classical moldings, executed in glazed architectural terra cotta. Merchants National Bank is located downtown at 11 South Meridian, where Washington and Meridian Sts. meet. A bank occupies part of the ground floor and mezzanine. The original banking room fills the other half of the first floor and mezzanine and can be viewed through a screen. Other parts of the building are private offices. 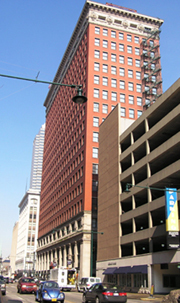 The building is best appreciated from Monument Circle due to its height.